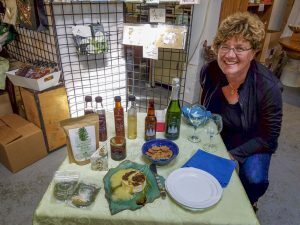 If You’re Looking For Novel Gifts For Snow Country Lovers, Yummies Made From Fir Trees Are Worth A Look. Laura Waters at her shop, Snowdon House outside Victoria, BC, Canada on Vancouver Island, where she sells edibles made from new growth on douglas fir trees. These include vinegars, jams, dried seasonings and more. It’s just the growing tips that you eat, actually. 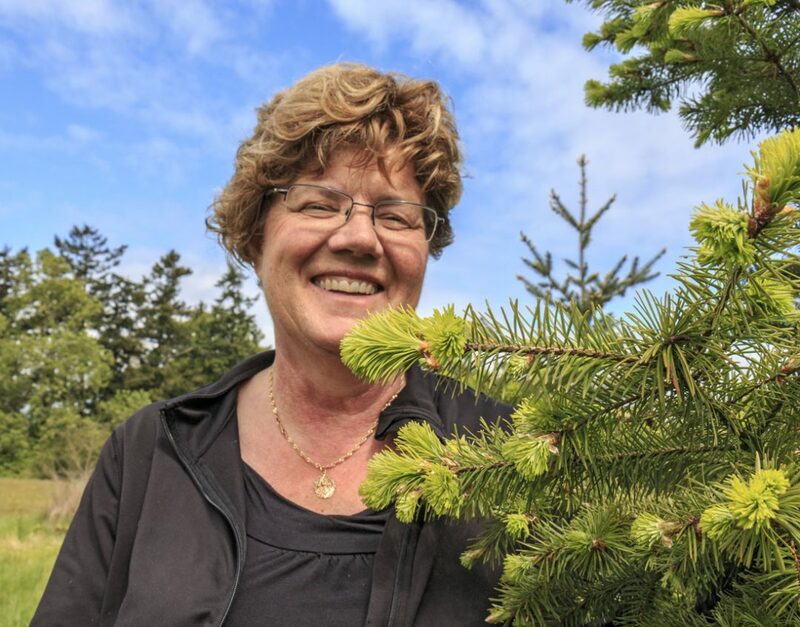 And the pine flavor is, well, way better than you expect if you are more used to sniffing pine sap from your fingers when handling fresh cut boughs. “But it takes six years for them to grow and then, all you wind up with is stumps,” she said one late spring day as we inspected the bright green growing tips of her trees. The same way that vinegar adds an essence of sweet/tang to fruit compote, the fir tips added … something. And it was a sweet and tangy something good. That experiment became Laura’s first strawberry fir vinegar. A bit of research revealed that First Nations people in the area used to make tea from the fir tips. It was not only tasty, it provided more vitamin C than citrus fruit. “When Capt. James Cook was on the BC coast, everyone had scurvy and the local natives told them to make tea out of the Doug fir tips. That took care of the scurvy,” Laura added. There are lots of way to take the essence of fir trees and make edibles. Laura Waters has literally “botted” trees. Laura’s first vinegar led to carbonated drinks, which led to fir seasoned bread, brie toppers, a drinkable vinegar that you add to evening cocktails, dried seasoning blends and more. She sells all this in her shop, Snowdon House, in North Saanich, a suburb of Victoria on Vancouver Island. While I was there, a group of visitors arrived. They had come up from Seattle by ferry and taken a cab out to the shop. Along with the visitors, I tasted the fir essence drink, a bottled non alcoholic drink that was amazingly refreshing. It had a piney back woods flavor that hit the top of my tongue, along with citrus and floral notes. I learned I could pretty much make my own with Laura’s fir vinegar, so I bought a bottle to add to tonic (with a bit of vodka) at home. We also nibbled our way through her Fir and Fire Brie Topper, which is actually a sweet, piney red and green chili jam that offsets the stringent brie flavor really well. Plus I bought a packet of dried seasoning blend (parsley, lemon peel, Doug fir, dried spinach, ground juniper berries) with which I plan to make a party dip. There’s a bread mix (with an added blend of Doug fir tips and juniper berries) that results in fresh bread with a pine accent. Laura also makes gift papers by hand and sells outside products such as organic hot chocolate mix wrapped in her hand made gift papers, plus there’s racks of her handmade gift cards. And fresh eggs she sells when her crowd of chickens are in a producing mind. In addition, she has created a collection of recipes and holds cooking classes. The one she did the day before I visited featured chicken thighs marinated in apricot and bay leaf vinegar, cooked in the vinegar, then wrapped in flat bread with mayo and her apricot/mango topper (yes, she makes toppers that don’t involve fir tips). If this isn’t enough, on her drawing board are plans to dehydrate the tips for a tea and she was experimenting when I visited with pickling fir tips to make into capers. And then, there was also the Doug fir flavor to be whipped into butter for popcorn topper. Plus the B&B she opened this year. Meanwhile, her shop is open Tuesday through Saturday 10am – 5pm. Yes, Laura Waters is a very busy woman.